Truly the epitome of a one-joke movie, this would have been a fun 10-minute short film. Unfortunately, it runs 85 minutes, and the additional hour and a quarter add almost zero in terms of comedy, horror or anything else. Here, Johnny (Ray) and Michelle (Compton) are employees of a particularly crap donut shop, at which Johnny’s mad scientist uncle Luther is a customer. 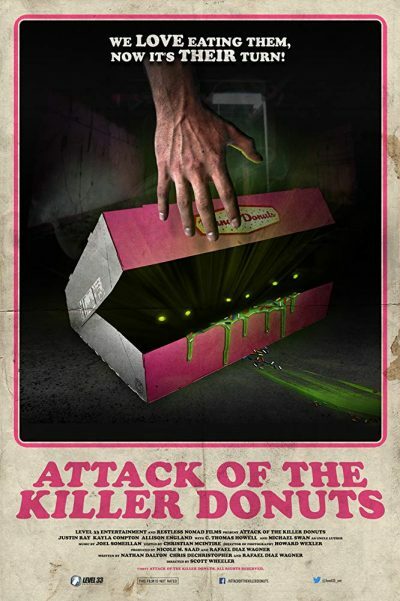 He’s working on a reanimating serum – yes, it is glowing green – and during an altercation in the store, the serum flies unnoticed into the fryer where there’s a batch of donuts cooking. 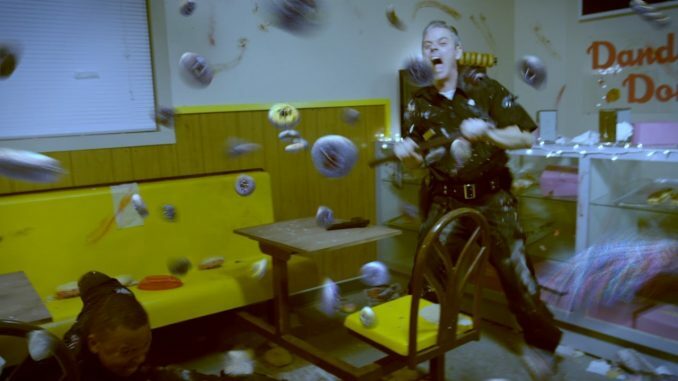 The resulting confections turn anyone who eats them into zombies with severe digestive problems; worse still, the cakes themselves develop self-awareness, mobility and a ring of fangs around their little donut holes. It might be salvageable, if the characters were people with whom you enjoyed spending time. They aren’t, beginning with a startlingly non-heroic hero. We’re supposed to have sympathy for Johnny, because his “girlfriend” only uses him to get money – my actual reaction was, “I see her point.” Michelle fares a little better, at least showing some spark when dealing with obnoxious customers, though the third member of the trio, Howard (Heyman), has a crush on Johnny’s mother which is more creepy than anything. Howell shows up as one of the town cops, causing me to wonder what exactly he was doing in this. [The correct answer is, “Working.”] It does provide an example of the low-hanging fruit at which the film aims, in that he and his colleague are named Officers… Wait for it… Rogers and Hammerstein. Oh, hold my sides, for I fear they may split. Set in a small town where the population is apparently 12 – literally, everyone in the movie is in the movie – this manages to occupy the uncomfortable spot below being any good, yet clearly failing to reach “so bad it’s good” levels of incompetence. It just sits there, like a box of last week’s crullers in your company’s break-room. At least I’m sure the cast and crew never had to go hungry during the shoot.